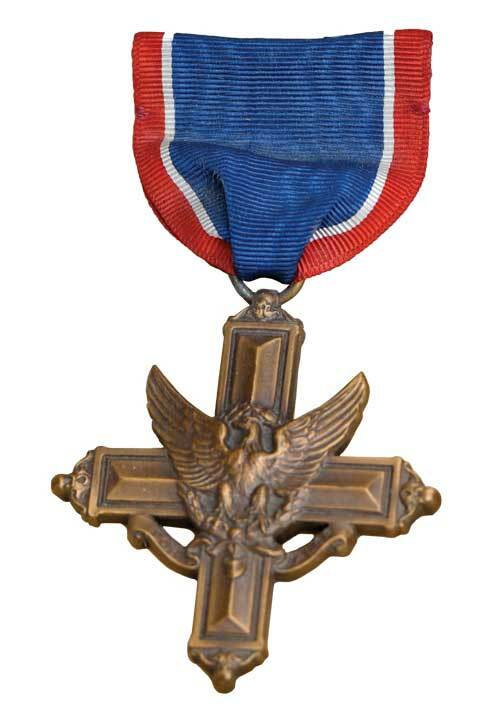 Every Distinguished Service Cross tells a story, as they are presented to soldiers who risk their lives in combat while exhibiting extreme gallantry. The medal is the second-highest military award given to members of the U.S. Army. The one stored behind glass outside the ROTC administration office in UM’s Schreiber Gymnasium speaks to that bravery. It also tells a love story. Barbara Adams didn’t know her life would change when she attended the “M” Club meeting in 1940. As a freshman at the University of Kentucky, she had enjoyed the Sadie Hawkins dance. When she transferred to UM her sophomore year, she thought it would be a fun addition to the social scene. She came to the meeting to see if the club would sponsor the dance. Running the meeting that day was the club’s president, Tom O’Donnell. Captain of the Grizzly football team, Tom was a Wyoming man. Quiet and kind, he was a natural leader. They connected instantly. They dated all that year and into the next, marrying in Monterey, California, on Jan. 18, 1942, alongside another UM couple. Barbara wore a blue crepe dress and a corsage of white orchids. The girls served as each other’s maid of honor. Like many of their generation, Tom and Barbara joined the military to serve their country during wartime. Tom enlisted in the U.S. Army, while Barbara joined the ROTC and earned her pilot’s license. 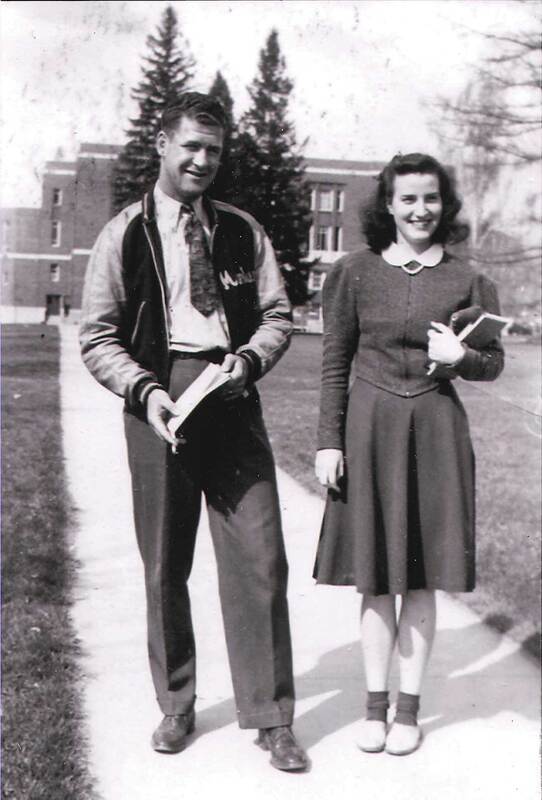 Tom graduated from UM in 1941; Barbara, in 1942. Tom was stationed in Northern California and soon was sent into active duty. Their future together seemed so bright. Then came the news that Tom was killed in action on May 26, 1943, during a battle on the island of Attu, off the coast of Alaska. Leading his company in an attack against Japanese forces, Tom was wounded in the neck and shoulder. His boyhood friend from Casper, Harold Hunter, died in the battle. Three days later, though weak with pain, he told his commanding officer he wanted to fight. He returned to his company, and six days after that was wounded again – this time mortally. For his grit, leadership and courage, Tom was posthumously awarded the Distinguished Service Cross. Standing on the Oval in front of Main Hall, Barbara accepted it on his behalf. She was 23. He had been 24. It was a life cut short, a love full of potential and promise never realized. Though she later remarried – and had a diverse career crisscrossing the western United States with Pan Am, Stanford University, the Boeing Company and ultimately the Billings School District – Barbara Adams Genest never got over Tom. Several years ago, Barbara contacted the UM Foundation to let the organization know UM was in her will. She wanted to set up a scholarship in Tom’s name, to honor his memory and support other students like him. The Foundation’s planned giving staff helped her prepare the paperwork to ensure her gift would be used as she wished. On Dec. 1, 2017, at age 97, Barbara passed away at home in Billings. Thanks to her extraordinary generosity, her gift of just over $2 million has created the Thomas Barton O’Donnell Endowed Scholarship. The scholarship will be awarded to students with financial need. Starting this fall, the endowment will support scores of students every year.